For the first time in the history of modern Ukraine, Cherkasy local authorities are going to demolish the Orthodox church! June 6, 2016 Fr. Vladimir received a letter from the Department of Architecture of Cherkasy. The letter demands believers "to release illegally occupied land," and otherwise threatens to dismantle the building forcefully. Cherkasy organization of veterans of Afghanistan in 2002 decided to build a temple here as a part of the memorial ensemble for Afghanistan veterans. Even the basement was installed in 2010 for the future temple, but construction wasn't finished due to the lack of funding. In the same time Fr. Vladimir agreed with the local authorities to build a temporary building for worship. The implication was that the graceful temple-trailer will be in effect until the consecration of the new church. This building was installed by local inhabitants themselves and at their cost. Unfortunately, it turned out that the city authorities "suddenly" decided not to build a church and stated that "there will be no domes and crosses in the memorial". They have already allocated money for the new memorial complex without the church, and now they want to dismantle the existing one in spite of the fact that it obviously will not interfere with construction works. "Well, why is it there? It is not necessary, there is a church right there" - Vitaly Chernuha, the city's chief architect said. But there are only temples belonging to the evangelists, Yegova's witnesses and the schismatic "Kievan patriarchate"! Deputy head of the veteran organization Vladimir Kovalenko says that "Afghans" are in favor of the existing temporary church to act in the future. Besides that, it is the only one church belonging to the canonical Orthodox Church in the area (see the attached map). And local authorities' decision creates obstacles and makes it impossible for believers to take part in divine services. That's why it seems to be an overt religious war against the canonical Church and violation of religious freedom. Moreover, demolition of a church building in general is a shame for historically Orthodox Ukraine! 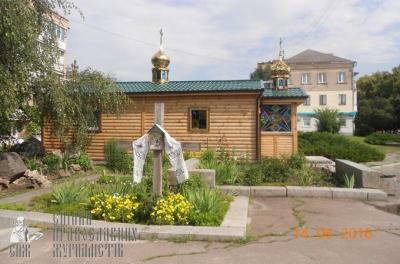 The church building is the property of the local Orthodox community. There is no legal basis to demolish it. The very heroes, who were meant to be praised by the memorial, like it. There are no local residents who oppose it. The decision of the city authorities violates religious freedom of Orthodox believers and seems to be a part of the State-run campaign against the canonical Ukrainian Orthodox Church. Please, help us! We would highly appreciate if you could sign the petition and spread the information! We want to preserve our church! Last update on July 22, 10:50 am by Nadia Bazuk.